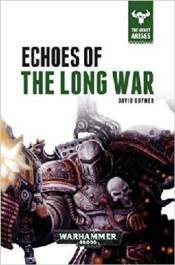 Space Marines are forced to ally with erstwhile foes to combat the orks in the latest in this gripping galactic saga. Paralyzed by the continued ork invasion of Imperial space, the rulers of Terra continue to fight among themselves. Finally losing patience with the High Council, Koorland ousts the Lord Commander and seizes control. Elsewhere, the Fists Exemplar are forced by circumstance to fight alongside the Iron Warriors. Where will such an alliance lead; can a Traitor Legion ever be trusted?